Swift Group knows it’s on to a good thing with Autocruise. Its van conversion brand tops the sales charts in this sector of the market, thanks to the efforts of its Rhythm models in a variety of guises (standard, budget-priced Sport and shorter Compact), with support from Jazz, Accent and Quartet. Of course, having nearly 50 UK retailers – more than any other brand – helps, too. Well, it’s taken things a step further – almost literally – this season with the announcement of the largest Autocruise high-top yet. Here’s the Forte, which takes Peugeot’s extra-long wheelbase Boxer as its start point. Or, if you want automatic transmission, your Forte can be made on Fiat’s Ducato. The width and height are no issue, but this is one long vehicle, by van conversion norms. It’s just under 6.4m, or just a couple of inches shy of 21ft, if you prefer. And yet, it feels just like any other Boxer-based motorcaravan to drive. There’s plenty of oomph from the 130bhp engine, and you’re barely aware of being in a vehicle that’s a bit longer than your normal van conversion. It’s all down to the extra overhang beyond the rear wheels. And such is the design, with a twin settee lounge here – any extra weight at the very back is going to be minimal. 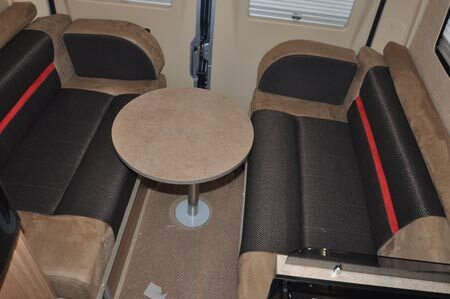 As for the rest of the layout, there’s a generous kitchen and more than acceptable washroom ‘amidships, whilst up front there’s a second lounge area that’s created by swivelling both front seats to face the half-dinette that also provides safe travel for a further two passengers. The latter definitely adds to the Forte’s appeal. Even if you don’t intend touring with four up, it’s that facility to carry passengers during its more everyday ventures that is the bonus. As we’ve come to expect from any Swift Group product, it’s a crisp and modern interior design – with quality upholstery and a rather neat all-ivory finish for the locker doors, all of which have positive catches. 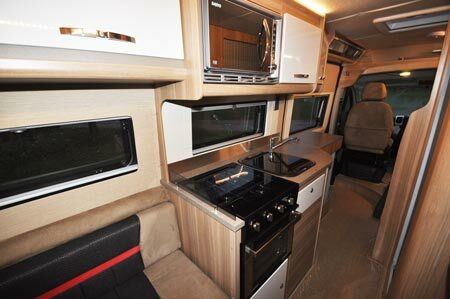 With that bit of extra space to play with, Autocruise has certainly come up trumps with the type of kitchen you’d expect in a UK-built coachbuilt, although not necessary in a van conversion. There’s a full cooker here, and good worktop space (although a drainer isn’t included in any form), with the fridge set opposite at a convenient height well above floor level. Adjacent to the fridge, the washroom is never going to be the largest, but the facilities are there for showering, toileting and washing – and, while the fixed sink will be applauded by some, others may feel it intrudes a bit too much into the shower area. Even making the beds is pretty straightforward. They’re both transverse, and therefore confined by the base vehicle’s dimensions. There’s always the opportunity to leave the rear made up as a permanent double, if there’s just two of you on board. Heating and hot water are from Truma’s latest Combi 2, which should cope with most weather conditions. There’s also extra 3M Thinsulate in all Autocruises these days – offering not just better insulation but also extra sound-deadening qualities. Even with a typically generous starting specification, it’s unlikely you’ll encounter a Forte without the £1,445 options pack. 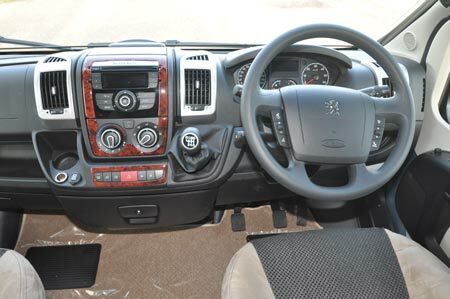 But, considering the extra kit it gives you, it’s well worth it – cruise control, cab air conditioning, microwave oven, reversing sensors, front foglights, dashboard trim etc. And it’ll pay dividends at trade-in time. Plus don’t forget the reversing sensors will get you a discount when it comes to getting quotes for campervan insurance. 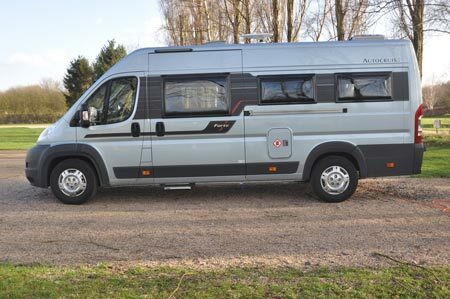 *Campervan insurance cost based on 2013 Autocruise Forte £45,230 fitted with standard fit immobiliser system and Tracker retrieve tracking system. UK travel only. Kept on driveway at home at TD9 8ED. Motorhome owners – professionals over 50 years old with no claims, convictions or health conditions in last 3 years. 4 years no claims bonus mirrored from car policy and 2 years motorhome driving experience. Members of motorhome club doing less than 5000 miles annually. £300 excess applies. Quote correct as of 13/02/2013. I bought this Forte last Sept and yes the payload is my concern. I don’t think I would buy it for 4 people, I’m going with my labrador around Europe on our own so it will be fine. I wanted something big enough for that but small enough to get down most roads especially in Cornwall. Having said that about the weight I have had to buy an electric bike instead of a vespa to put on the back just in case. With everything on board I think I will be fine as its just me and Millie, but for 4 people I would not recommend. Also not sure how you would fit everyone in. Maybe its designed for two adults and two children. Thanks for your comment Vivienne. 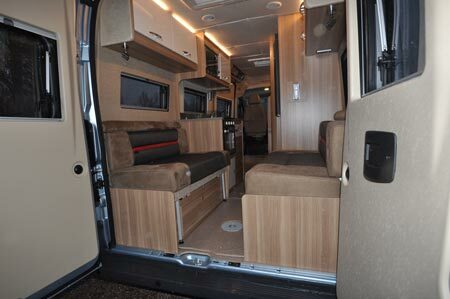 Great to hear feedback from an actual owner of this motorhome. I am currently assessing what high-top to buy and have settled on the Forte as ‘perfect’ because it has two totally separate ‘own space’ sleeping/lounging areas which are essential because only myself and my grown-up daughter will be using it. However I do have some concerns about payload. Whilst I can get everything in that we (myself & my daughter) need when I tried to do so for four people (it is a four berth) I was over 100 kg over weight so I wonder what other camper’s experiences are.